Most historians feel The Social Security Act of 1935 is the most important piece of legislation passed in our government's history and directly led to the Social Security benefit programs that we enjoy today. Gaining some form of economic security for the country's aging population has been a major problem since the inception of the United States. The act was created during the Great Depression to provide immediate finanacial relief for those citizens who were slipping into poverty. The distress experienced by many was the impetus for the law as the country wasn't prepared for the social changes that took place during one of the worst economic demises. 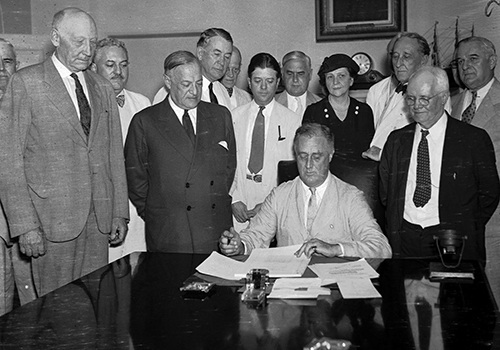 The Social Security Act was enacted on August 14, 1935 as part of President Franklin Delano Roosevelt's Second New Deal program that was designed to redistribute the nation's wealth. Roosevelt wanted to create a committee (Committee on Economic Security) to oversee the logistics of implementing a benefits payment program that covered retired workers and victims of work-related accidents. The act was designed to pay wokers 65 years old and older an income after they had retired. 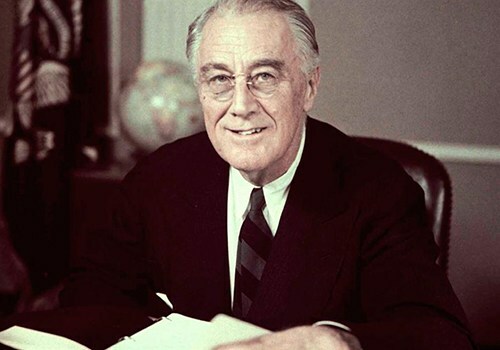 Roosevelt added several provisions to the Social Security Act that dealt with the general welfare of the unemployed, poor families and handicapped individuals. The Industrial Revolution brought large groups of people to big cities looking for work, but the jobs available didn't offer long-term security. The urbanization of the United States found people fending for themselves and leaving their extended family behind. That wasn't the case prior to the Industrial Revolution as the country had an abundance of farmers, who banded together to support one another in times of trouble. Millions of people were unemployed during the Great Depression, but the hardest hit group was retired Americans who lost their savings and were struggling to survive. Opposition to the Social Security Act has been around since its inception as distractors weren't convinced that the legislation worked in the best interest of the country. They argue the act failed horribly in providing assistance in the disability portion of the bill because it was too complex to be effective. However, all legislators agreed that basics principals of the Social Security Act was to end the depression and bring permanent prosperity to the country. Their hope was to create a financial assistance program that stimulated the nation's economy through consumer spending. The act has been amended several times since its inception, often to extend benefits to surviving spouses and their children as the program coninues to thrive today, and yearly changes to the Social Security program still occur. This wasn't the federal government's first attempt at guaranteeing some sort of financial assistance to the elderly. They promised pensions to all enlistees to the Union Army in the Civil War as this legislation became law in 1879. This assistance program failed horribly because it was mismanaged and vastly underfunded. Lawmakers in the Roosevelt Administration knew what type of political challenges lied ahead of them, but they didn't want to create legislation that had the same characteristics of past failed assistance programs. Still, government officials were working with the private sector on developing a program that insured economic security for all United States citizens, especially the elderly. Legislators wanted to duplicate successful charitable organization whose funding came directly from private donations. The Social Security Act is a variation of how European countries provide economic security for their citizens. President Roosevelt requested Secreatary of Labor Frances Perkins to draft the legislation that aimed to help those inviduals and families suffering from the affects of the Great Depression by offering them some economic relief. Perkins created a monthly payment plan that workers contributed in a form of a payroll tax that was taken out of their paychecks. This would pay for their own retirement and other benefits provided in the Social Security Act. There was no guarantees that the money spent by beneficiaries would exceed the amount spent by taxpayers. Still, the committee thought they had created a solid plan to provide some form of economic assistance. The plan to begin collecting the tax for Social Security began in 1937, with payments beginning to retired workers in 1940.